New Liturgical Movement: Renaissance Butter Knives Inscribed with Chant Score for Grace! Renaissance Butter Knives Inscribed with Chant Score for Grace! How about this as a way to encourage the family to pray grace beautifully? 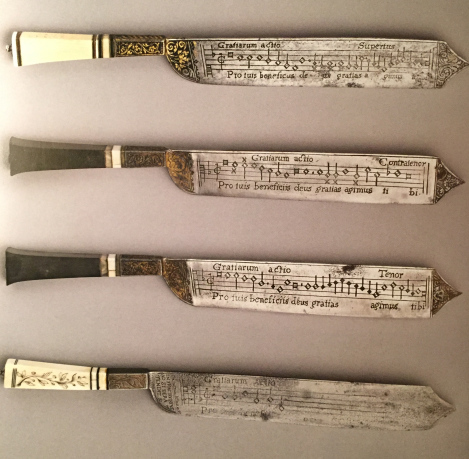 These four knives with ivory or ebony handles and etched steel blades show how music would enhance devotion tin the Italian Renaissance home. Each one is inscribed on the blade with the name of a voice part (‘Superius’, ‘Contratenor’, ‘Tenor’ and ‘Bassus’) and the words and music of a Benediction on one side of the blade and a Grace on the other. Read the full article at blog.pontifex.university.